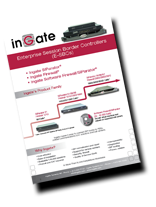 Ingate’s Enterprise Session Border Controllers (E-SBCs) enable a seamless transition to SIP and Unified Communications. Ingate E-SBCs ensure integration between the PBX and all major Internet Telephony Service Providers (ITSPs), including SIP trunking service providers, for fast, simplified deployments. They apply enterprise-class security features to every installation with support for NAT and PAT as well as TLS and SRTP to encrypt the SIP signaling and media, eliminating the security issue most commonly associated with using enterprise VoIP. Ingate E-SBCs are delivered as hardware or as a software solution that can be fully integrated into your IP-PBX offering. They are available in a range of sizes, handling from 5 up to 8,000 simultaneous calls. Contact Ingate today for a free trial, pricing or for more information. Ingate also supports SIPconnect, allowing the enterprise to successfully connect to SIPconnect-compliant SIP Trunking service providers quickly, easily and securily.